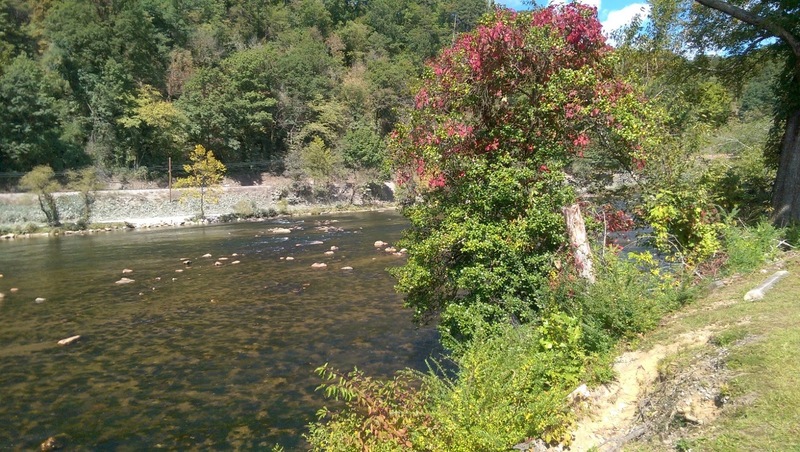 September 2015 – He Said What?! 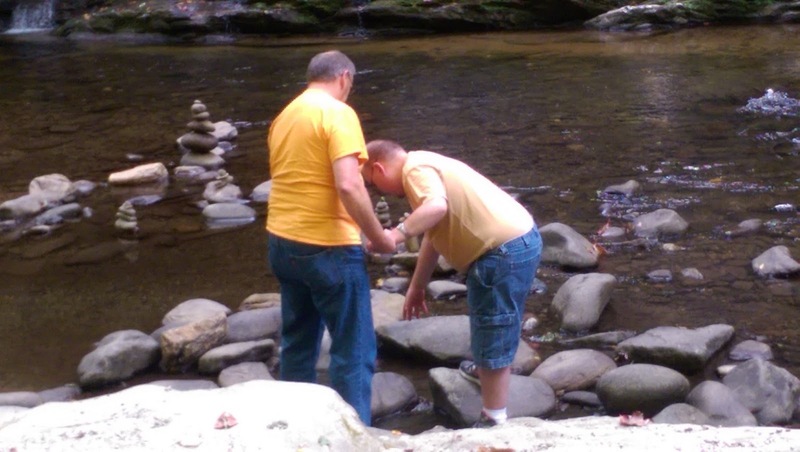 Last week Gary and I took Aaron with us on a vacation/work trip back home to our families in both West Virginia and North Carolina. It had been way too long since Aaron had been home with us, so it was nice to have this opportunity to take him along. 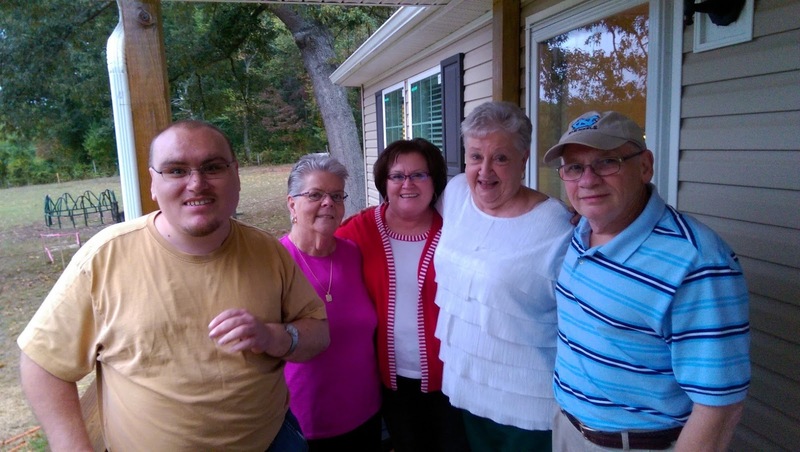 One purpose of our trip was to meet with my brother and sisters in West Virginia, and to go through all the items that were left in our mother’s storage unit since her death in May. 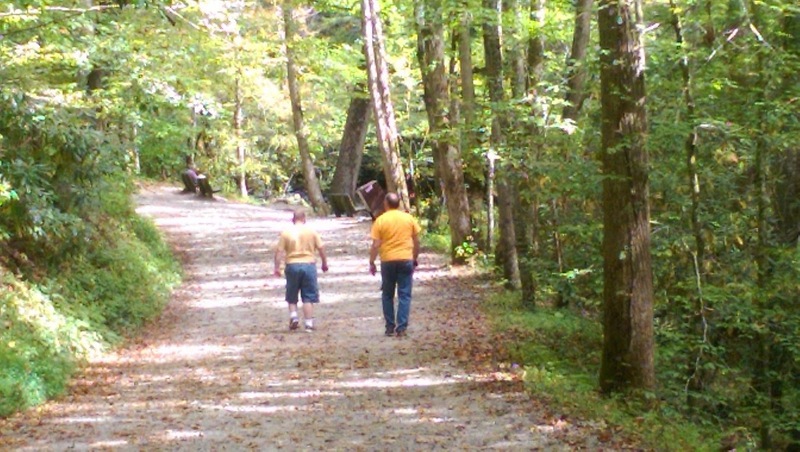 Then we went down to Gary’s hometown in the North Carolina Smoky Mountains. 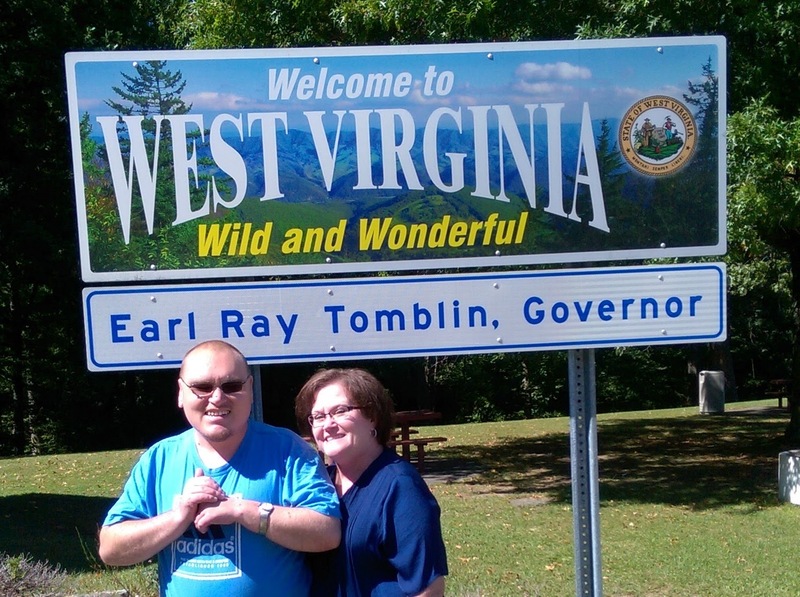 We hadn’t been there in ages, so we spent more time there than in West Virginia on this trip. Aaron is really a good traveler, which is surprising in some ways since he loves his routine and loves his things in order. But he also loves time with us, and he loves the snack bag that I fill before we leave, and he loves the motel, and he definitely loves eating out. He makes sure that he nails down the fact that we ARE eating out as we hit the road bright and early on the day we leave. When that fact is established to his liking, he then seeks to determine if we’re eating IN a restaurant. 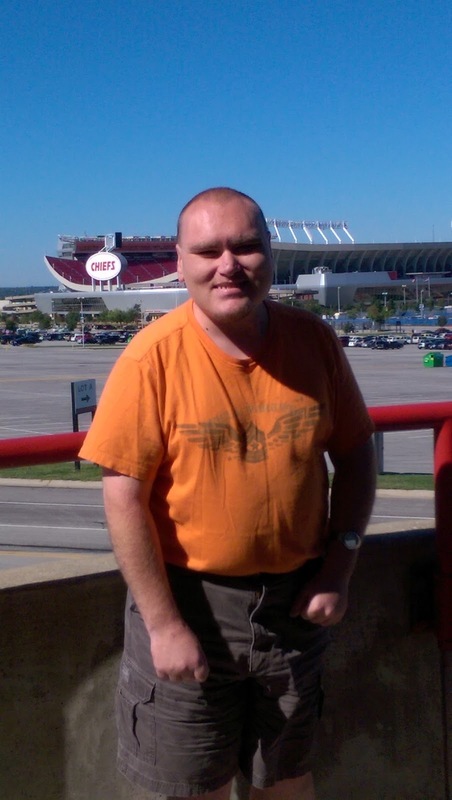 We usually stop at this particular rest area in Kansas City, which overlooks both the Chiefs and the Royals stadiums. Aaron was only slightly impressed with that, pausing long enough for me to take the first obligatory picture of our trip…..the first of many that he tolerated as we vacationed together. He was far more impressed with the Cracker Barrel where we ate a midday meal later that first day. He loved the stuffed turkey that he and Gary found in the gift shop, and couldn’t wait for me to press the turkey’s wing. Aaron rubbed his hands together in delight as the turkey sang, “Hey, good lookin’, what you got cookin’? How about cookin’ something else but me?” We heard Aaron sing that song several times that day. 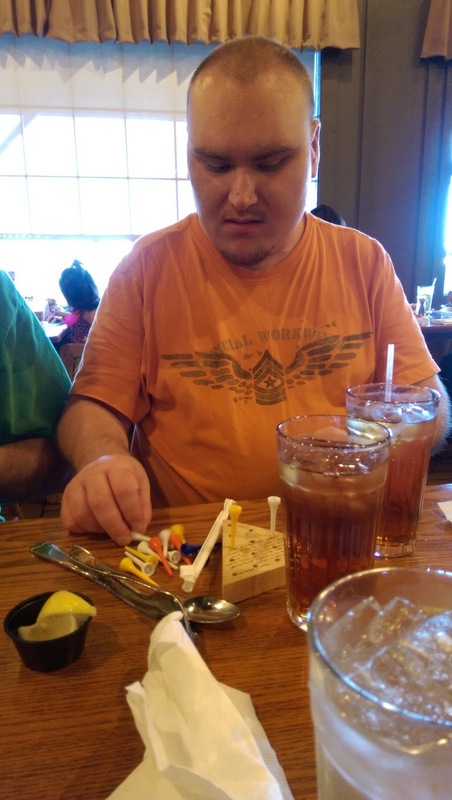 And he also played the peg game while we waited on our meal, beating Gary on his first try! Our server there was so kind to Aaron, smiling at him with understanding and even bringing Aaron his very own travel map. Several servers on this trip were that way with Aaron…..showing kindness and even delight on the unique way that Aaron interacted with them. Aaron quickly set up house at John and Jeanie’s when we arrived in Princeton. We had barely said hello before he was deciding where he would perch himself and his DVD player, looking for an outlet and not at all concerned about rearranging furniture or grabbing a chair on which to place his DVD player in front of him. He did the same thing at his Aunt Sandra’s when we got to Bryson City on Tuesday. Never mind unimportant hugs or pleasantries. The most necessary business was to get himself situated and comfortable. Hellos and hugs and small talk was for the rest of us, after we helped him line up his little corner of the world just right. Aaron really did very well in so many ways on this trip. 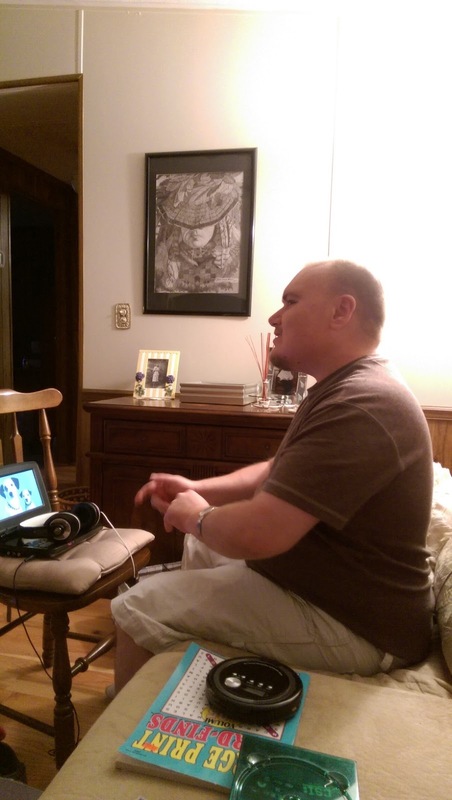 Of course, he had times of frustration when he didn’t want to go somewhere that we went…..or he wanted to be on my tablet looking up GI Joe videos instead of going to see friends….or he was a little tired of seeing too much pretty scenery. We had to work a few times to try to derail him from the track of frustration that he was on for the moment without becoming totally frustrated ourselves. Then there were his loud noises which were new to many in the family. He sure can make people jump! But there were very many moments to treasure, far more than the ones that we would rather forget. He sat in our vehicle for over five hours while we went through Mom’s storage unit, watching Looney Tunes DVDs and making tons of crazy noises. Like Mary Beth said, he was our sound effects while we worked. I just wonder what the family down from us thought as they worked on their unit. He hugged family and friends, he talked all of our ears off about aliens and other interests, he kept up a weird schedule, he slept in different beds, and he tolerated hours of driving. Here are more pictures of some of the things that were very special during this trip. 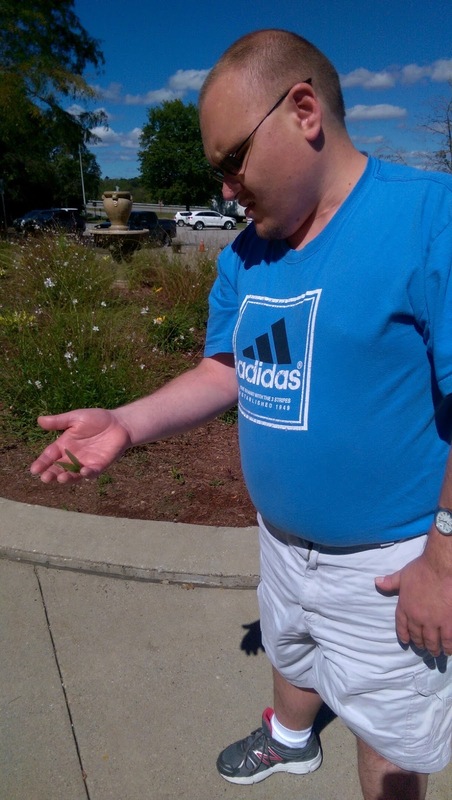 He found a fun bug at the West Virginia rest stop. He was happy to finally be in West Virginia. And happy to also go to North Carolina. We had a delightful visit with Leo. We ate at Naber’s……TWICE!! Look at the view right there! He sang for Aunt Sandra. 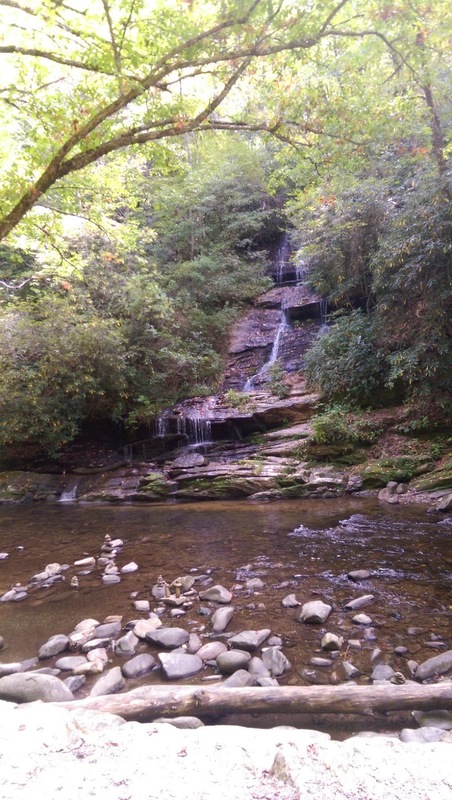 We went walking up Deep Creek. 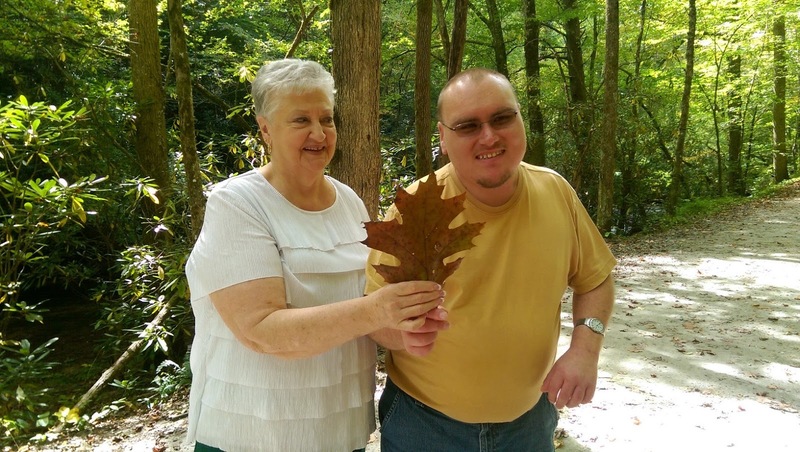 while Aunt Sandra found a HUGE leaf!! 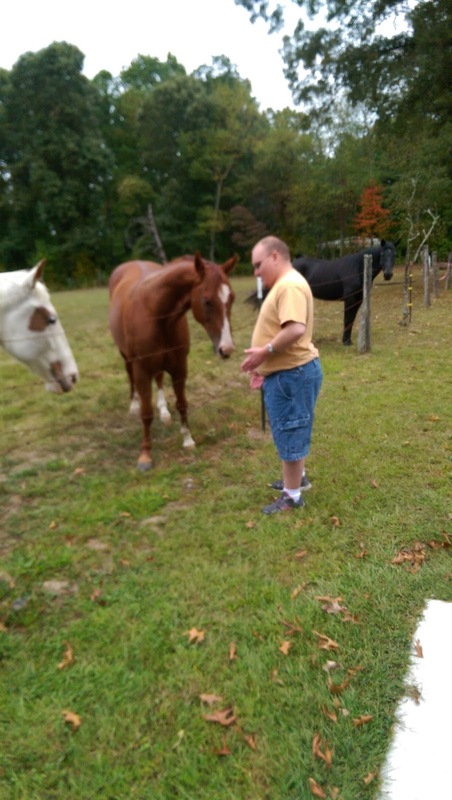 and pet and feed the horses in the pasture beside their house! Those are just a few of the wonderful times we had on this special trip. On the day we left to return to Kansas, Aaron had a mild seizure while still in bed early that morning. He had another big seizure in the car on the interstate, and a larger one that night in the hotel. He thankfully had just gotten out of the shower before that last seizure, and was sitting up in bed reading. He hit his head really hard on the headboard as the seizure jerked him backwards, and then on the nightstand as it threw him sideways, but thankfully he was fine. God was good to protect him, and to let him have a full week of fun and family before that seizure hit. 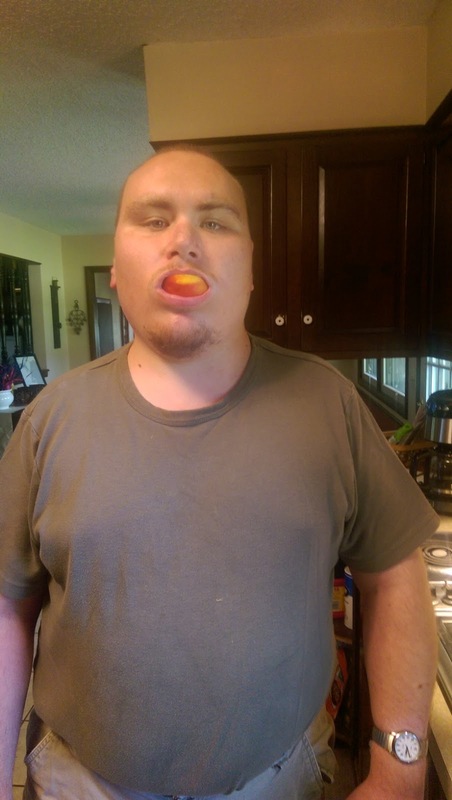 It was a reminder of how fragile he really is in some ways, physically, and of how tough he is as he rebounds despite a sore head and a bitten tongue and not being able to taste food the next morning. It jerks Gary and I back to reality, but also causes us to be thankful for every good day and special memory during our family trip. It may not always be easy to have Aaron come along, but it’s always worthwhile to have him along with us…..not just on this trip, but along this journey of life together with our special son. Small Victories That Are Huge! Anyone who knows Aaron or who has read my blog knows that Aaron is very set in his ways. He is regimented about his life in every area. When his routine or his order is disrupted, he will often react strongly. Or if not strongly, he will react persistently until we just sometimes give up and realize that some issues are not worth the fight. Here are a couple examples of his way of doing things. The first concerns time, and how he will only do things at certain times. For instance, he will only turn on the television for Wheel of Fortune at 6:28. Not 6:27. It must be 6:28. The other night, Aaron and I were playing Skip-Bo. 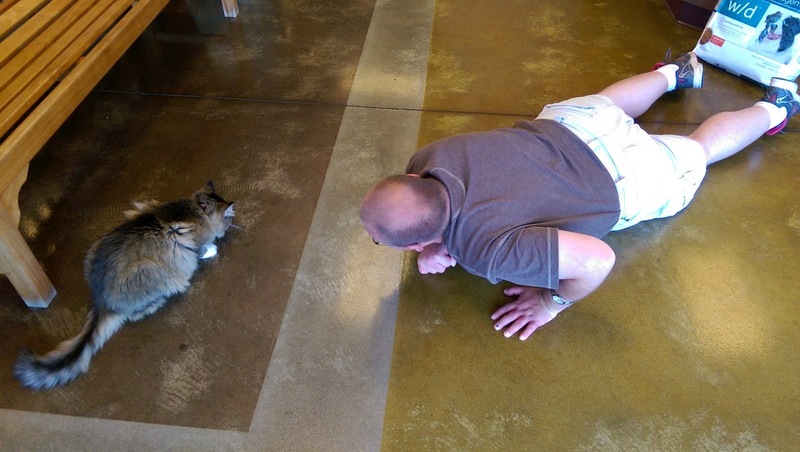 We finished our game….which he won, by the way. He recorded his win in his notebook that keeps our scores, which shows him far ahead of me…..and which gives him great delight. “Let’s go to bed,” I said. Aaron looked at his watch, pushed nearly halfway up his arm…..another way he does things. “9:59,” he answered in all seriousness. This time I did laugh, though not the belly laugh I desired. He just looked at me like I was being ridiculous, which made it even funnier. He is so funny, really, when he does this time thing. I love it! So he got up and proceeded to get ready for bed. He sees absolutely nothing remarkable about this, but I do totally enjoy these glimpses into his unique mind. He likes to sleep in his sweater, but with his huge pile of covers it’s just too hot for that. His reason for sleeping in his sweater is that he feels cold at those times he may get up at night to use the bathroom. He mentioned that fact the other night, so I suggested that he take his sweater off before climbing in bed and just leave it beside the bed, putting it on if he has to get up during the night. We went over this change at least twice as we got his bed ready that night. That’s right, Aaron. Three times now that he had gone over this change. Maybe two minutes later, another knock on the door. Yes, Aaron. Nothing about that changed in the last two minutes. Make that four times he had now gone over this change. But this was a big difference to Aaron, and he wanted to be sure he had it down pat. And now he does take his sweater off at night. Good for him! We have two other victories lately that I want to share. One is about his bedroom. 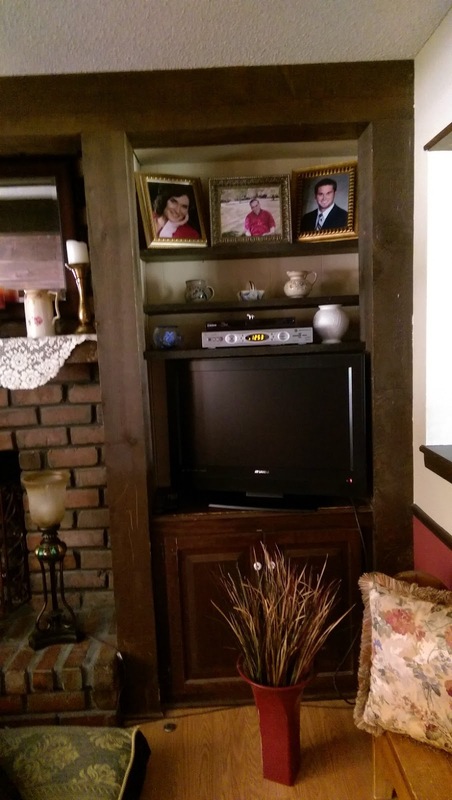 We not only just had it painted, but Gary suggested that we change the arrangement of his furniture. I was skeptical, but Aaron has done very well with this change…..for the most part. He has a new bedspread. I told him I really didn’t want his animal print blanket to cover his pretty new bedspread, so this was a little challenging for him to accept. “I want it normal like it used to be,” he told me. Still I showed him how I made his bed. “I don’t like the way you do it. 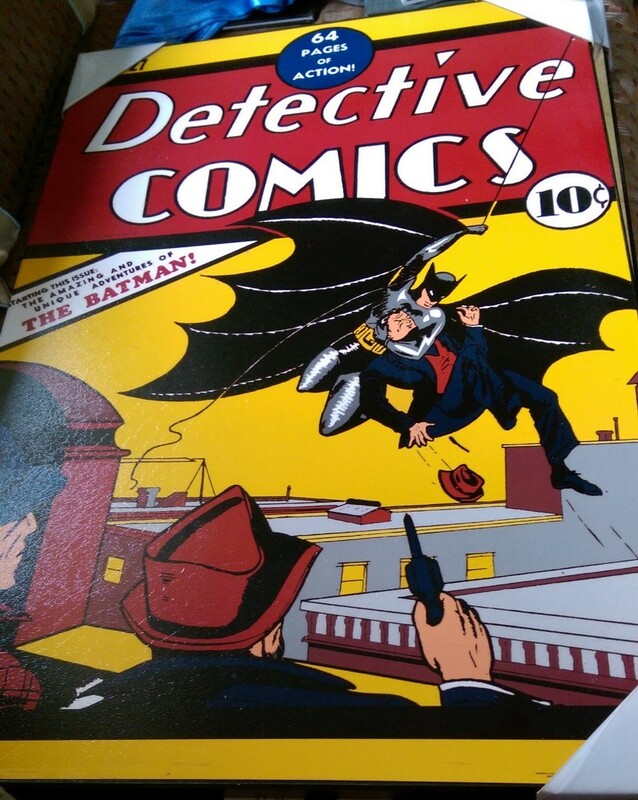 The cover is bent,” he continued. One day he watched carefully again as I demonstrated it to him. He still wasn’t sold on it, but he did watch me as I made the bed look like this. I walked up the hall the next morning, and found this. I was delighted! Aaron had tried to make his bed, even putting his pillow in the right place under the covers and then trying to tuck the covers under it. Was it perfect? No. 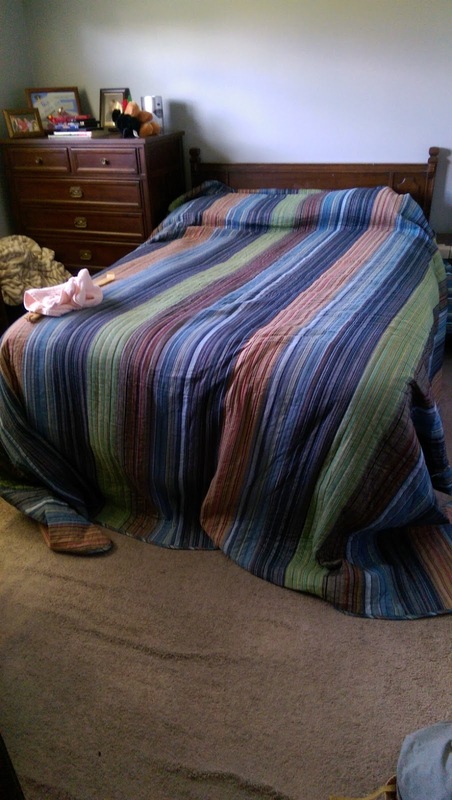 But to me it was beautiful because it showed a willingness to make his bed in a new way. Progress! YAY!! 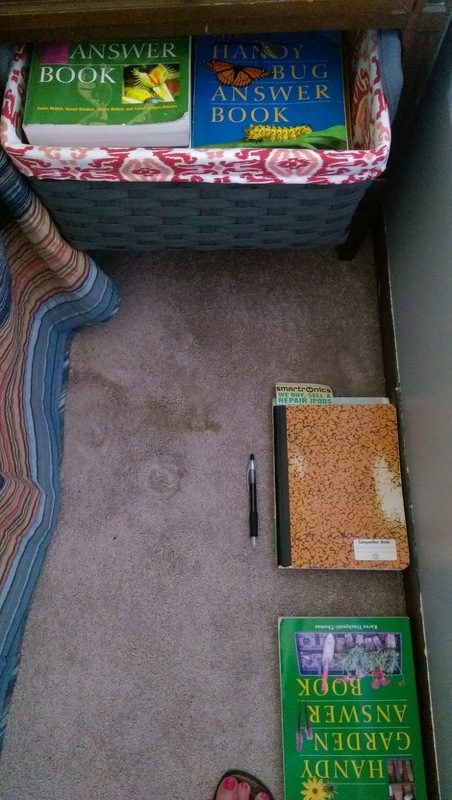 He likes to put his Handy Answer Book on the floor, along with his bedtime log notebook and his pen. I got a nice bin to put those things in, but he wants nothing to do with that. 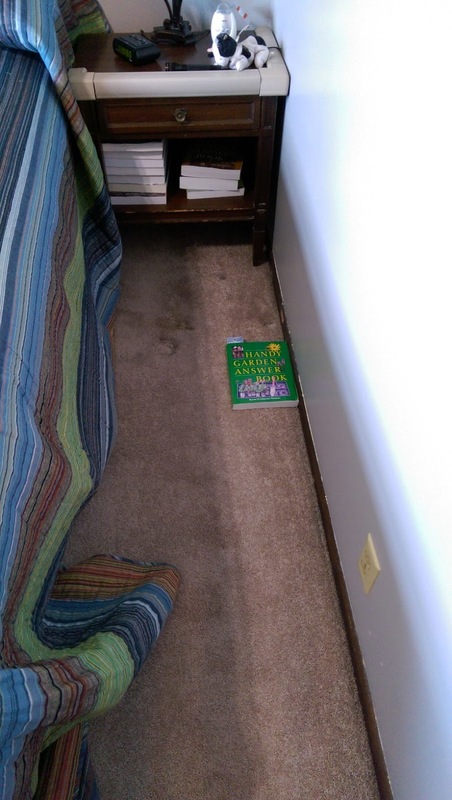 He’ll keep his other books in there, but not these items that he has always kept on the floor. So I’m not stressing over that small matter. His other area of routine, and victory, concerns leaving earlier than usual for his day group. I signed up to take a Bible study on Thursday mornings, but it means I need to leave close to 8:45 instead of our normal 9:15……..just on that one day. I talked to Aaron days before it was to happen. He listened, but I knew he was mulling over this dilemma. Then he said he would do it, and I was pleased, but skeptical. 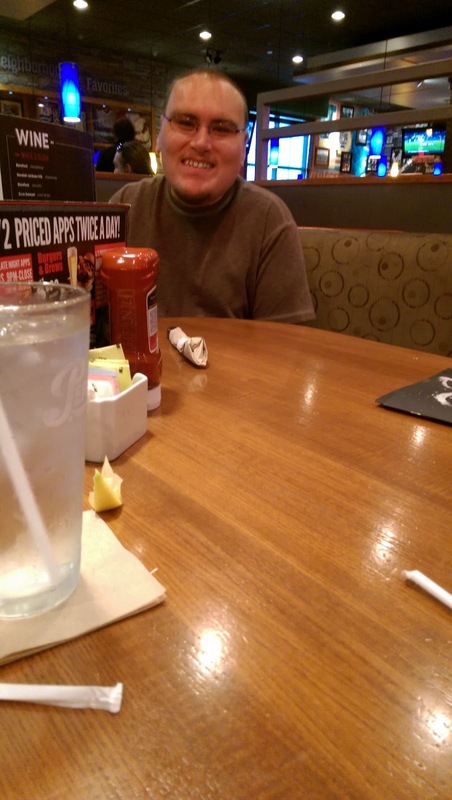 On Wednesday night before the day of the big change, Aaron came downstairs where a friend and I sat. “Mom, I want to leave by 9:15!” he blurted out as he stomped across the room. I knew exactly what he was talking about, and my heart sank. He walked out of the room, but turned and barged in again. “I want more time on my computer!” he angrily said. And he sat on the couch beside me, and gave the ottoman a resounding, very loud whack with his big hand. He finally calmed down as I told him we would talk later, but at bedtime he seemed fine. I was full of trepidation as I walked in his room the next morning, carrying his coffee and wishing that of all mornings he would have gotten up early like he sometimes does. He did get out of bed and one of the first things I heard was, “I want to leave by 9:15!” I heard this from him several times that morning, but he wasn’t really angry. And when it came time to go, don’t you know he got in the van and went at this early time without a fight? I was so pleased and surprised and very relieved! I pointed the beautiful clouds out to him as we drove to Paradigm. I gave him an extra dollar before he got out of the van, and he was very pleased with that. 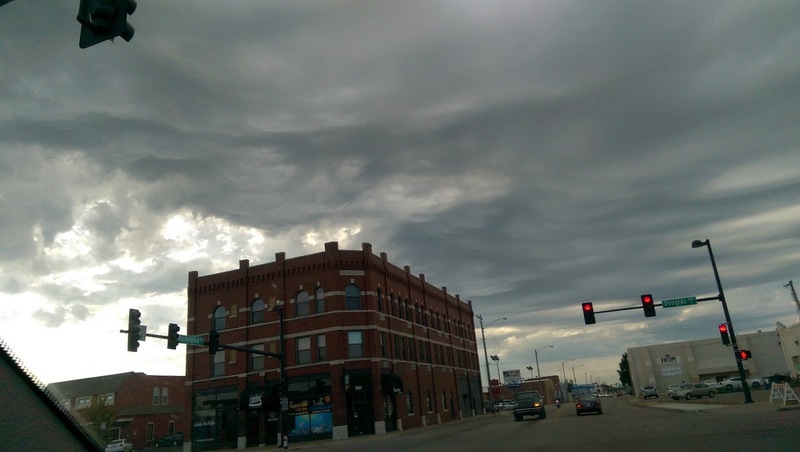 And as I drove away, in Old Town Wichita, I looked up at the gorgeous sky and I remembered that I needed to thank God for this real blessing on this morning. It was a tangible touch of God’s grace in my life and I was so thankful for that. My friend at Bible study asked me how Aaron did, and she told me that she had been praying since Sunday for Aaron to do well. That was another blessing! I had no idea that she was praying. So between sweaters by the bed and new bedspreads being accepted and leaving early yesterday, I have reason to give Aaron a high five and a congratulatory thump on the back. No, not the thump on the back. He’ll return the hit and it won’t be soft, trust me! Extra dollars don’t hurt nearly as bad. 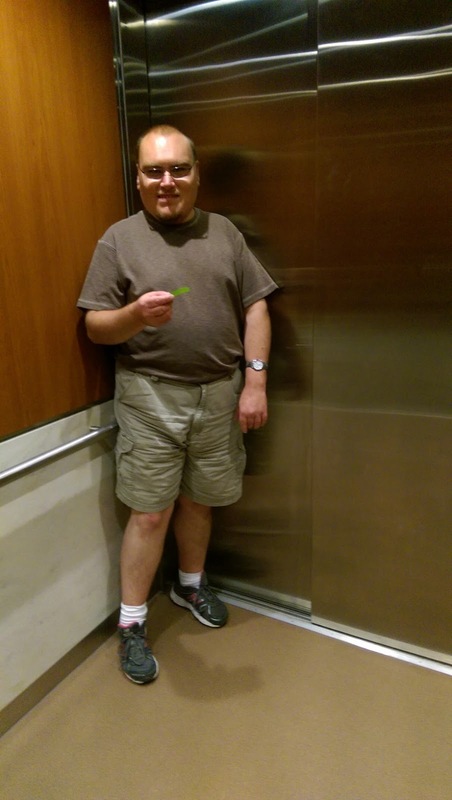 Author hesaidwhatksPosted on September 18, 2015 February 28, 2016 Categories Adult Autism, Asperger's Syndrome, Change, Grace, Special Needs Adults, ThankfulnessLeave a comment on Small Victories That Are Huge! This past May our mother passed on to heaven. 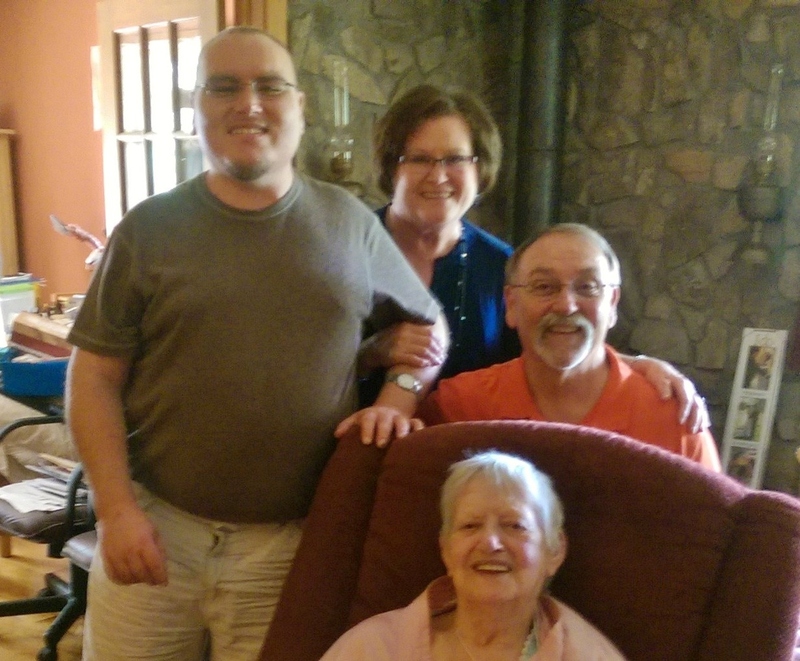 We said our final earthly goodbyes to her on May 8, and thus began our year of those firsts. Many of you know them…….those first special days that you spend without that special person. Our first “first” came quickly. Mother’s Day occurred just two days after Mom’s funeral. Isn’t that just like life? Life doesn’t wait on us to get ready for the things that are hard. They happen whether we’re ready or not. Our next first is tomorrow. Tomorrow is Mom’s birthday. She would be 89 if she had lived to see this day. I know, though, that none of us wish her back. We had been saying goodbye to her for a long time as the symptoms of Alzheimer’s overtook her brain and body. What a sad disease it is! Alzheimer’s takes a person slowly, robbing them of their essence and their personality and their memories. 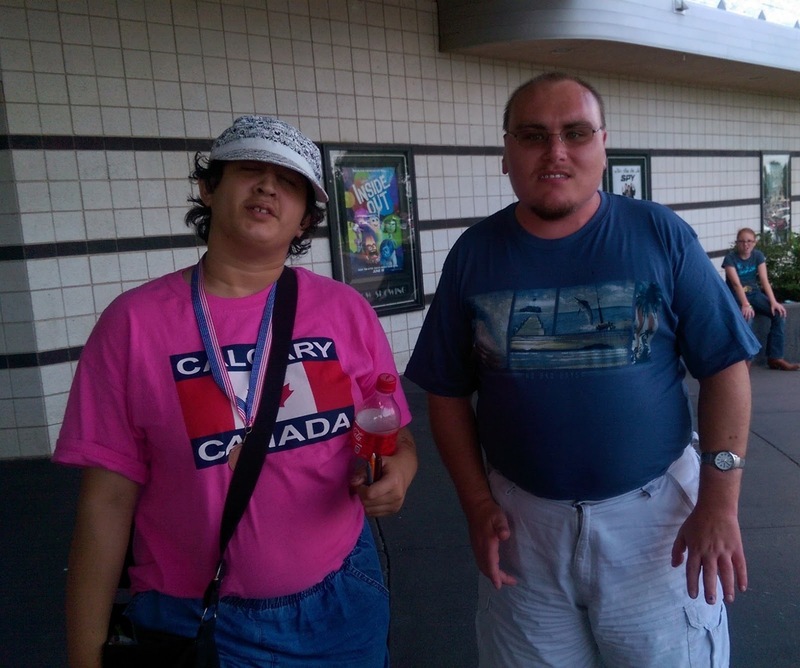 I’ll never forget going to see Mom last year, in June of 2014. When Gary and I entered her assisted living apartment with Jan, Mom not only didn’t know us at all, but she didn’t even show any joy that we were there. She would usually at least act happy to have visitors, but on this visit she was completely devoid of even that. 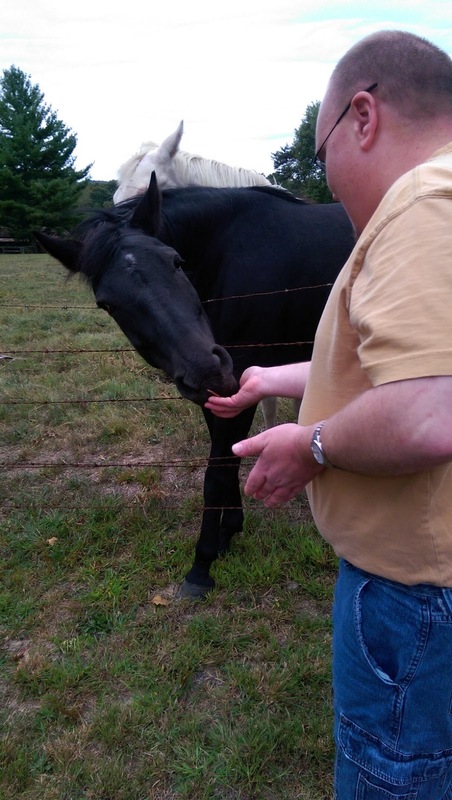 For the first time, I did indeed feel like a visitor…..and an ignored one, at that. 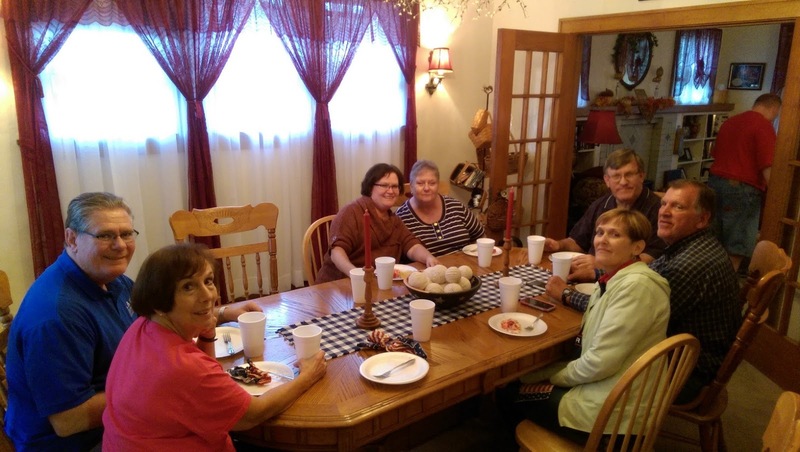 Our visit that June was also the one where we gathered around Mom in the kitchen at Jan’s house as we sang hymns. Mom sang with us, surprising us all. That time was deeply precious to each of us, including Mom. Her eyes lit up as she sang. She smiled and she tried to express what she was thinking about each song. She remembered words very well, and we knew that each song resonated with her deep in her heart and mind. Before we left that evening to go on our separate ways once again, Mary Beth wanted us to all put our hands on the table together, and take a picture. I’m so glad we did that. Something about that picture is so personal…..so tender. There is our mother’s hand, nestled among her children’s. Her hand shows the effects of age….of hard work….of arthritis. But her hand is beautiful. And us….our hands also show the signs of age that are creeping upon us. 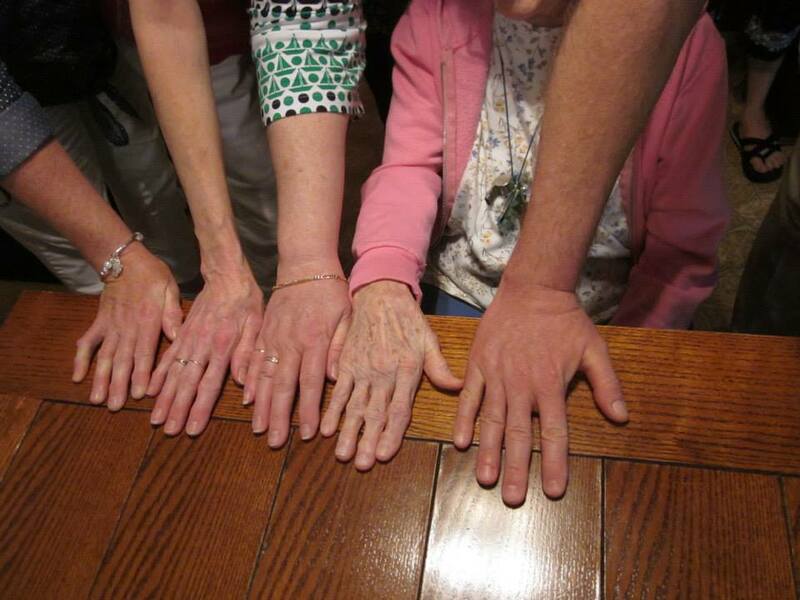 You can see some spots…..some lumps on our joints…..and several of us have that funny little finger that Mom had. I look at that picture and I think of how Mom’s hand was always in our lives. From an early age her hands were ever busy with caring for us five children, and for Dad. I remember her hands cooking and baking, sewing and cleaning, caring for sick children and looking after busy children. She used her hands to show us how to make little troll doll clothes out of felt while she sewed real clothes for us to wear. She used her hands to let us turn the handle on the food chopper as she made Cranberry Salad for Thanksgiving. She used her hands to fill our table with huge baking sheets of homemade rolls while she pinched off little pieces of dough for us to happily eat. She used her hands to teach us how to set a table and how to wash dirty dishes after loading the sink just right. Her hands wiped our tears…..and sometimes caused our tears as she spanked us for disobedience. Her hands worked to grow beautiful flowers and delicious vegetables, which she froze and canned and cooked and shared with others. Her hands taught us how to do the laundry and to fold the clothes correctly. Her hands taught us to iron whatever she had placed in our four baskets, each basket bearing the name of one of us girls. Where was John’s? J Her hands taught us how to clean a house, how to hem a dress, how to play some of her favorite card games, how to make a bed the RIGHT way, how to take care of our varied pets, and how to plan the many practical jokes for which she was famous. Perhaps the most important use of her hands was when she would open her Bible in the early mornings as we all sat around the breakfast table. Dad would have already gone to work, so before we left for school, Mom would be sure that we all opened our Bibles as she did. She would read from the Our Daily Bread devotional book, reading the selected Bible passage first and then reading the devotion before we prayed. Her commitment to God and to us was never more evident than during that precious time together every morning. Her hands made each of our wedding dresses and bridesmaids dresses. Her hands cared for us after each of our children was born. Her hands loved and doted on her grandchildren and great-grands. Her hands knit literally countless numbers of Christmas stockings for family, friends, friends of friends, friends of family, pets……you get the idea. Her hands quilted each of us a totally handmade quilt after she retired. Then those always busy hands made, again, an untold number of quilts for others to enjoy. Her hands took meals to shut-ins. Her hands stuffed envelopes for the Crisis Pregnancy Center, for missionaries, and for church. Her hands cared for Dad for eight years as he fought cancer. And it was her hands that he wanted to scramble his eggs that he loved during the final few weeks of his life. Only her hands would do, and I understood that totally as I stepped aside and let her do this thing that she loved so much. It was in their little kitchen that I noticed her hands doing things differently than she had ever done…..and I knew that the Alzheimer’s was lurking, waiting to overcome her in the following years. Her hands worked hard to care for Dad during that final month that he lived. He preferred her hands above all others, but he knew that she was struggling, and so he allowed Jan and I to help as well. But it was Mom’s hand that he reached for as they sat on the couch. It was Mom’s touch that comforted him when he was so sick. It was Mom’s hand that he held as he lay in his hospital bed…..her hand reaching through the bed rails as she lay alone in their bed beside his hospital bed. 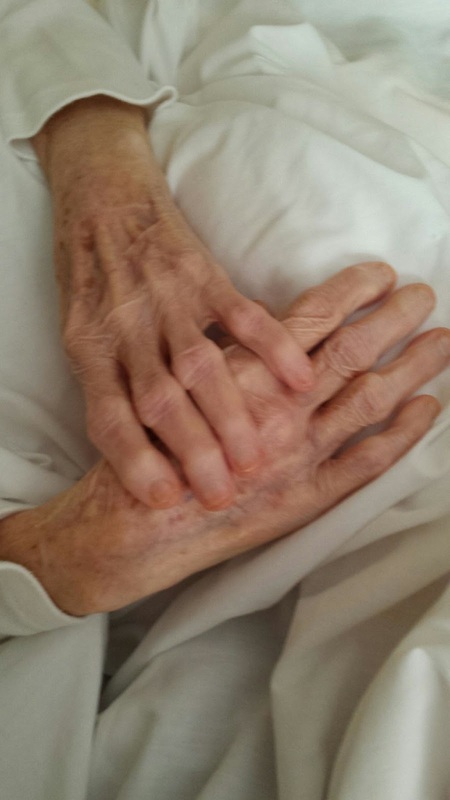 Jan took one last picture of Mom’s hands as she lay dying this past May. There they were, crossed on her lap, still and unmoving. She was nearing the end of her time on earth. Her hands, though, spoke volumes to all of us. I’m again so thankful for the picture that Jan took. Her hands showed the evidence of years of love and work. Now her hand’s work was done. It was time for her to rest. But the work of her hands will never be done. Her work in our lives does indeed live on. So much of who we are and what we are is because of her beautiful hands in our lives. None of us King children would be who we are today without the influence of her godly, kind hands. Then our children, and their children, show the impact of Mom’s hands. What a treasure is to be seen in those soft, wrinkled hands! I’m pretty sure that her hand is now holding Dad’s hand in heaven. I doubt that they’ve let each other go since she’s joined him there. Unless there’s work for her to do, and then I can totally see her using those hands to make something or to keep things straight. I wonder how many quilts she’s made by now? The Proverbs 31 woman was described as one who works with willing hands. Our mother did just that, and for the rest of our lives we will benefit from her wonderful, willing hands in our lives. Happy Birthday, Mom. Thank you for your beautiful hands in our lives. You will always be loved. “I am NOT going to Paradigm today! !” Aaron yelled at me. Here we go, I thought. This will be one of those mornings. And it was. It all happened last Friday. I’m not even sure what set Aaron on that anger path, but he was on it for sure with no apparent sign that he would exit anytime soon. “Go away from me!” he loudly said. Yet he kept coming into my room while I got ready, standing there telling me angrily that he wasn’t going to his day group. But he knew the consequences of that decision without me uttering a word. No Friday pizza. 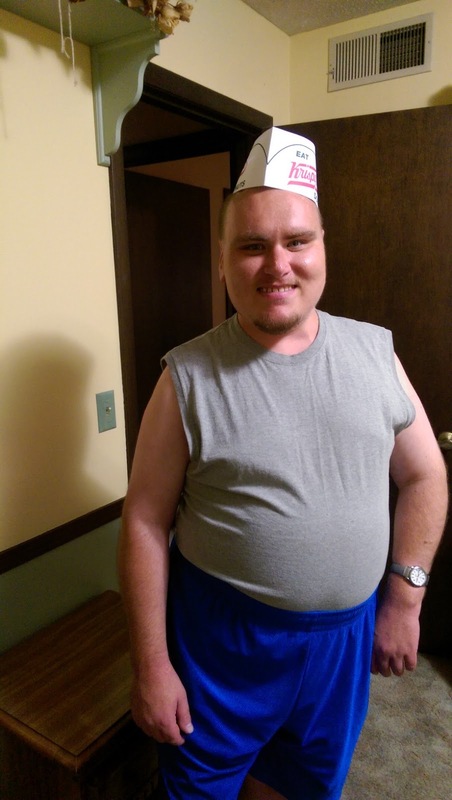 He was in quite the dilemma as he stood there asserting himself, knowing that the further he dug his own hole, the further away he would be from his pizza supper. Plus I wasn’t responding back to him the way he wanted. He wanted anger from me, which would only feed his anger. Aaron was ready for a verbal fight, and Mom wasn’t cooperating. I stayed as calm as possible while still being firm, even though I wanted to yell every bit as loud as he was. Finally Aaron stomped away, walking up the hall to his room. And then I heard it. Aaron threw something up the hall, where it landed on the floor outside of my bedroom. I knew what it was without looking. It was his watch…..his broken wrist watch. He had broken it at Paradigm almost two weeks earlier, although the details are still unclear. Nevertheless, it was broken and I didn’t replace it immediately. 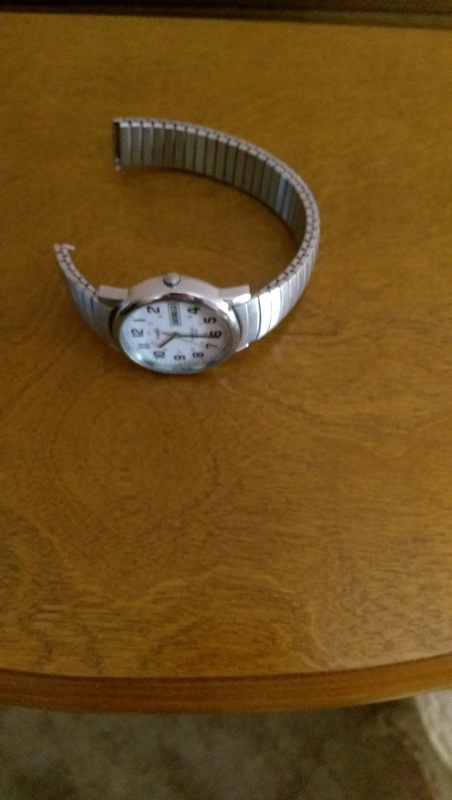 So on this anger morning, Aaron decided to focus his anger on his broken watch….demanding a new one once again and complaining about how much he needed his watch. Aaron could tell that I was getting ready to leave the house, with or without him. “OK!! I’ll go, if you’re going to MAKE me! !” he said, dripping with frustration. I silently went to the van, where he followed me and then stopped. He went back into the house and retrieved his broken watch, stuffing it in his pocket. He couldn’t wear it on his arm, but every day he had put it in his pocket and taken it with him anyway. Today was no different. We were mostly silent on the way to Paradigm. It was later than usual. Aaron was sullen and still steaming. I was deflated and tired. Earlier, as my friend Atha and I texted, I had said to her, “There are times I truly wish for a normal life.” I always feel guilty after expressing myself that way, for I know that this life is what God has somehow allowed me to have. I want to be like Esther, who came to realize that God in His sovereignty had put her in the place she was for that particular time. Yet sometimes the place of us special needs moms seems to just be a place of frustration and dreary sameness. We do get tired, especially on the angry days such as I was having with Aaron. He got out of the van, still irate but somewhat calmer. I just drove away, weary. But I thought about Aaron with his broken watch in his pocket, carrying it with him all that day. He also carries something else with him, something that often feels broken. My heart and spirit. A mother is a mother, forever changed by the children that carry part of her with them for the rest of their lives. Aaron isn’t the broken one, but I often am. I need God’s grace and strength so many times on this road, and He never fails me. But I still feel the pain in my heart, my heart that Aaron unknowingly carries with him…..tucked away, just like his broken watch. 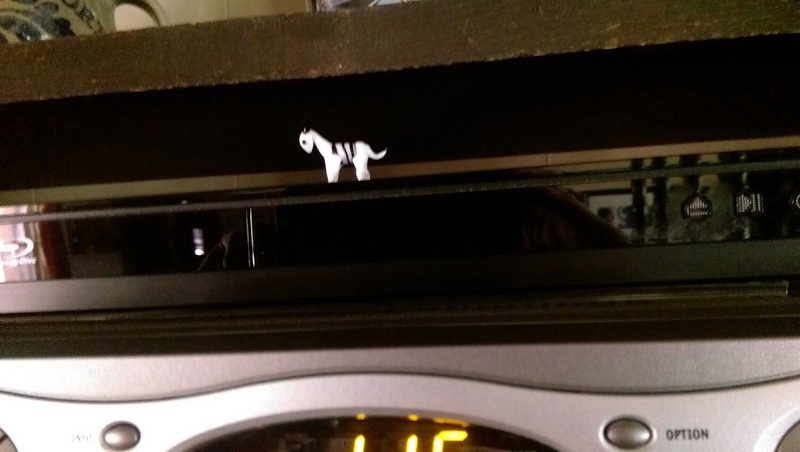 Later, I walked in the house and my eyes were drawn to a very little porcelain figure perched on top of our DVD player. Aaron and I had set it there a couple weeks earlier. I thought of the story told by that little figure, the love it represents. Aaron had been to the zoo on Friday of that week. He came home, excited to tell me about his favorite animals that he saw. When I asked him if he had bought anything to eat, he told me that he had not bought any food but had instead bought something for me. But with regret he told me that he had left it at Paradigm. So when I took him to Paradigm after the weekend, on Monday, he was very excited for me to come inside with him so that he could hopefully locate his surprise for me. He barreled into Barb’s office with me in tow, and Barb immediately pulled out of her desk a small brown bag from the zoo. Aaron couldn’t wait for me to open it as he handed it to me. And there inside the bag, wrapped in bubble wrap, was….well, what was it? It was so tiny that I couldn’t exactly tell. 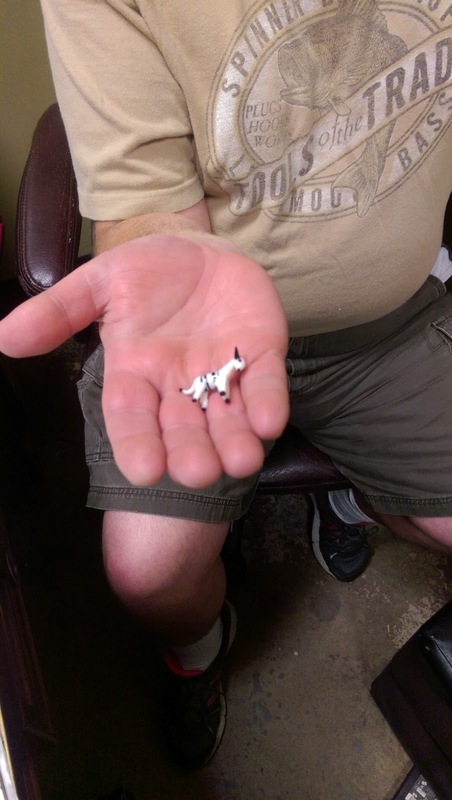 Aaron was rubbing his hands together as I gingerly pulled out a little porcelain zebra. Why a zebra? I have no idea. But I loved it. 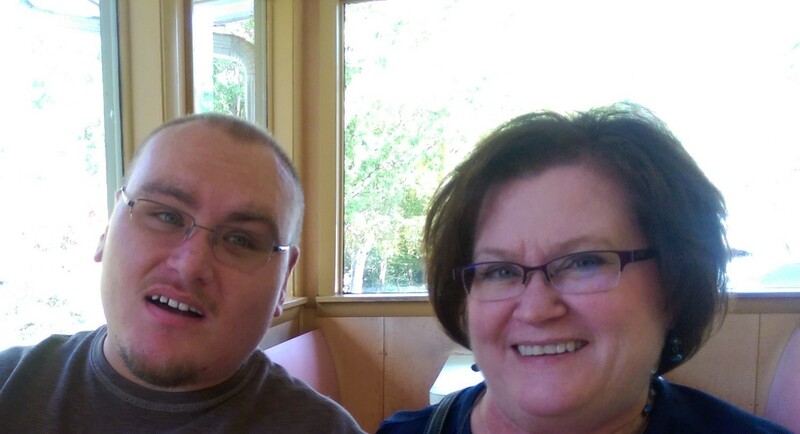 I loved the fact that Aaron had spent all of his money on Mom…..even though I worried that he went hungry. What a special, loving gift from my son! Now it sits on top of our DVD player, where it’s mostly safe from being broken. You can hardly see it from across the room, it’s so little. 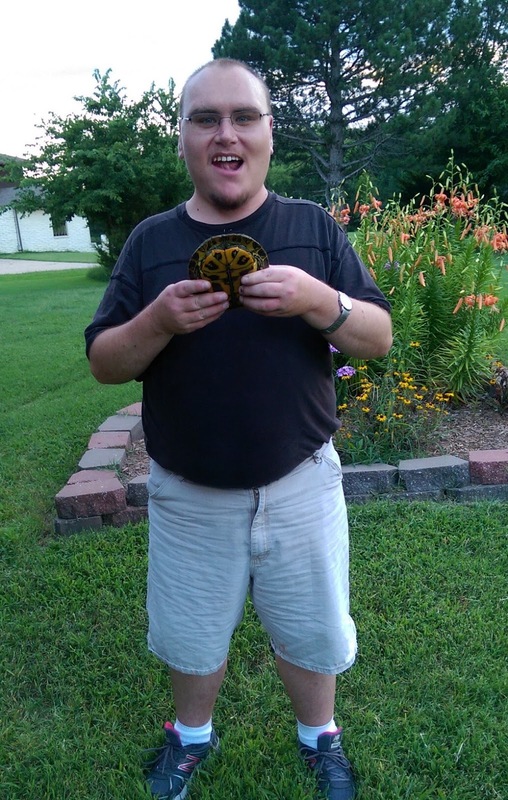 But the joy on Aaron’s face when I opened it was huge, and so was the joy in my heart. My heart, like all mom’s, holds at times great joy and then at times great hurt. As with every situation in my life, then, I have a choice to make. I can’t ignore the hurt forever and I can’t capture the joy forever. We all experience both. But I can choose which to dwell on the most. I can linger on the brokenness and carry it with me, like the watch in Aaron’s pocket as he carried it there day after day. Or I can choose to see the beauty, hard as it may be, that does often surround me in my life with Aaron. Brokenness or beauty…..it’s my choice. In every area of life, that choice is mine to consciously make. As I deal with Aaron, it’s also a decision I must choose. Will I see Aaron as a blessing? Or will I see Aaron as a burden? Will I allow my grumbles and sighing and my desire sometimes for a “normal” life rule my thoughts? Or will I pull back, take a breath and pray to my heavenly Father, and then choose to see the blessings? Even at the end of the day, if all I can say is, “Well, at least Aaron and I are both still alive.” Hey, I’ll take it! It’s a blessing!! On that angry Friday, that tiny zebra reminded me that I do have many blessings and joys in this life with Aaron. Sometimes they’re harder to see than at other times. Sometimes my spirit is very frustrated and tired…..but so is everyone. Really, we all experience plenty of both in our lives. I bent over and gently lifted it, realizing then that the main stem of the pepper plant was unbroken and was still safely in the soil. “Why not just leave it and see what it does?” I thought. And that’s what I did. I left it to grow if it would, knowing that if I messed with it and tried to bend it back up, I would just break it and kill it for sure. So I let it remain where it was, bent over and not looking too promising at that point. 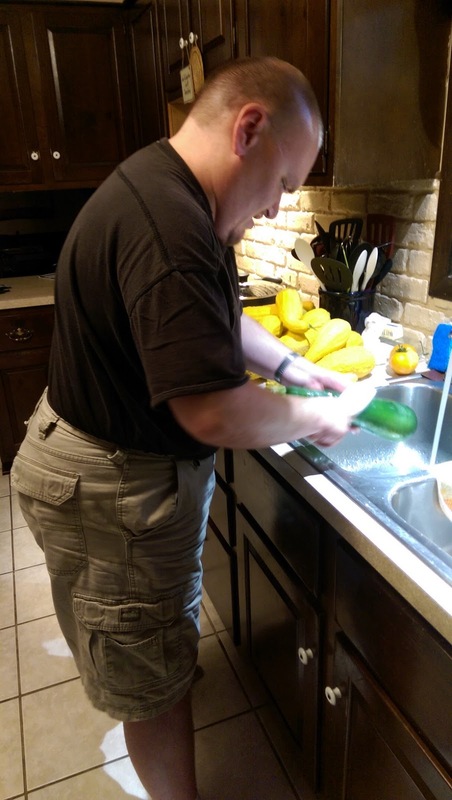 This past Saturday, I went out to the garden to harvest the last of the zucchini and squash. They have now fallen prey to heat, lack of rain, and bugs. Their brown vegetation only served to accentuate what I now found as I stared down at my pepper plant, still bowed down in the dirt. 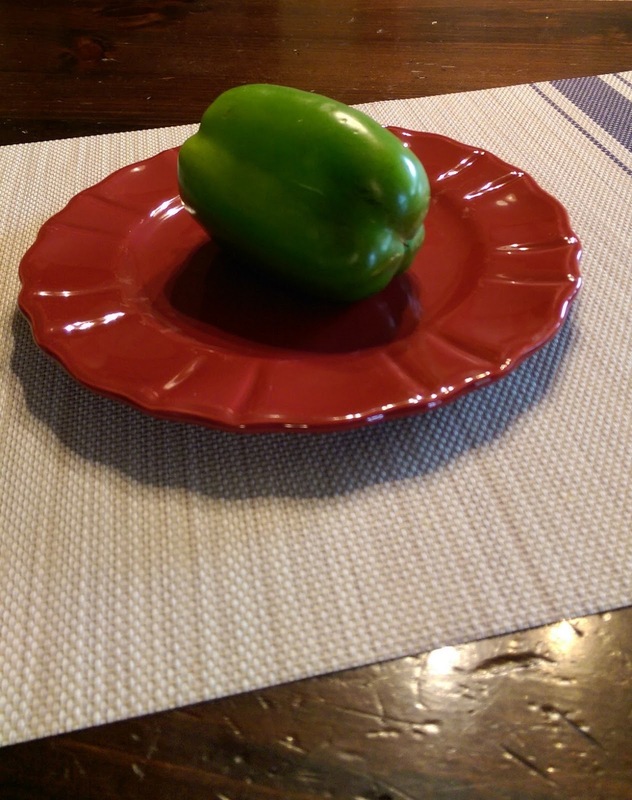 Though my pepper plant was stooped low to the ground, its leaves were bright and green. They were quite a contrast to the brown ugliness around them. 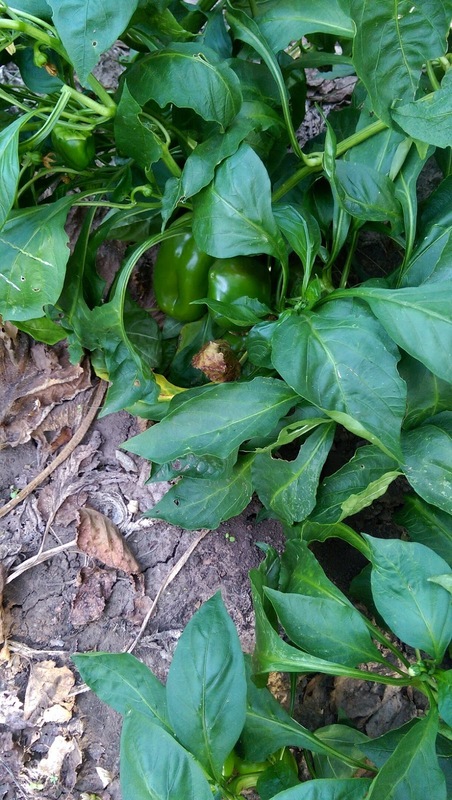 And there, under the leaves, were peppers……peppers that hadn’t been there when it first fell to the ground in the storm. They had grown since the plant was blown over in the storm. 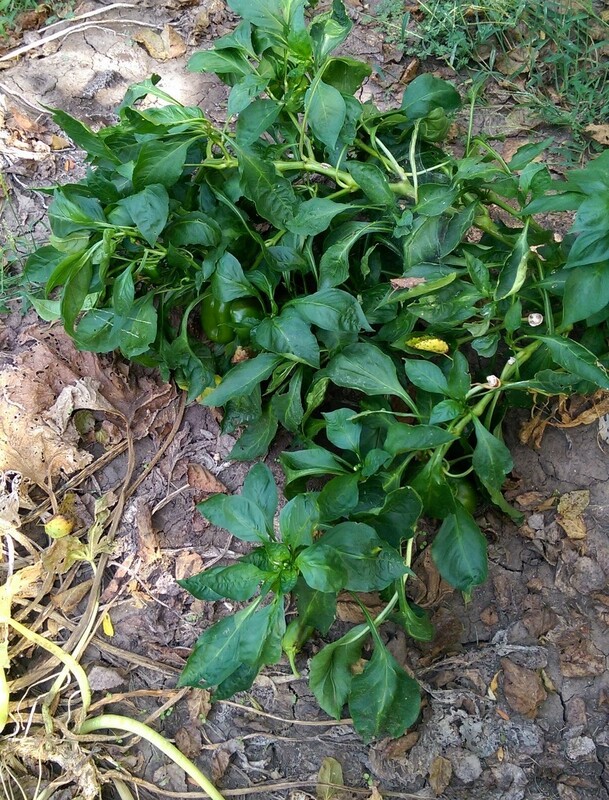 Firm, pretty green peppers that were the fruit of this plant that had been pummeled in the storm, yet still survived. And not only survived, but was producing fruit there on the ground. I don’t remember a time when I’ve seen so many people suffering in one form or another as I have in recent months. I routinely communicate with or receive prayer requests from those dealing with serious health issues themselves or with someone they dearly love; others are going through divorce and single parenting; parents are struggling with children who are living apart from the Lord and how they were raised; others are very lonely and are feeling set apart; some are grieving the death of someone they love; and of course, I know many families who are weighted down by the particular challenges of raising a child with special needs. So many heartaches from so much suffering! What’s a person to do? And primarily, what’s a follower of Christ to do? James opened his book of the Bible with this very issue. He didn’t waste time in laying the subject of suffering out on the table. “Consider it all joy, my brethren, when you encounter various trials.” James said what? Consider it joy when we suffer? I love that the word “various” here means “multi-colored.” Doesn’t that describe our life’s struggles so well? We all encounter many different forms of suffering in our lives on earth…..many multi-colored afflictions. Sometimes I wish my life was a bland, constant egg shell color myself. Yet we all know that bland isn’t how our walk on this earth turns out. When James talks about testing producing endurance, he uses a Greek word that means to bear up as we abide under difficulties. Notice the word “under.” Not to bear up as the trials are removed, or the suffering is lessened, or the answers are made clear. No, we are to endure UNDER the suffering…..while the suffering is going on in our lives. Then James says that this endurance will produce maturity and full development…..its perfect and complete result in our lives. Considering suffering to be joyful is not a trait that comes naturally. How do we do that, anyway? Like my pepper plant, down in the dirt and buffeted by the storm, we sometimes find ourselves bent over with the storms of life. Tired, defeated, scared, and just lying in the dirt. But our roots are in Christ, and it’s from Him that we draw the strength to “consider it all joy.” We may not feel joyful on many days, but we can in obedience thank God for our trials and for what they are teaching us. We can say the words even if we don’t feel it in our hearts. That’s called faith. Faith that God is indeed working all things out for our good. 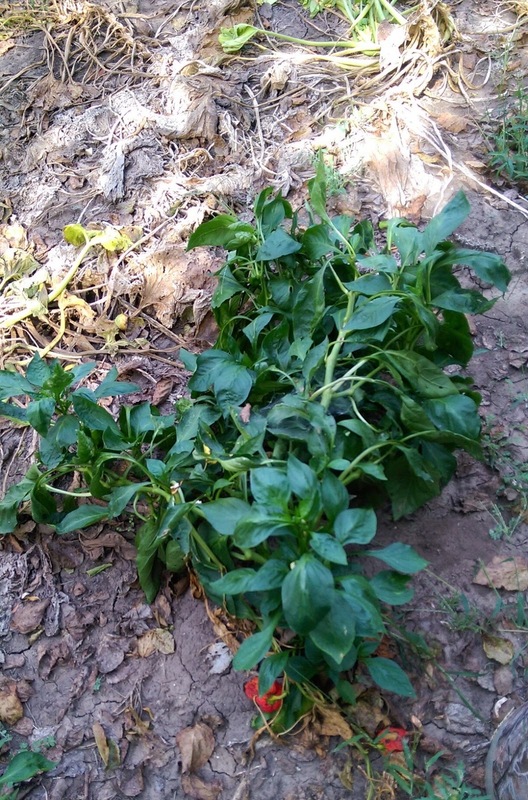 I saw those green peppers growing on that pepper plant, despite its pitiful condition. And despite my pain and my doubt, when I trust God with my situation and I praise Him in the storm, it won’t be long before I’ll also see fruit growing. James talks about some of that fruit as he mentions maturity and development. He also says that I will lack nothing. My faith will grow, my thankfulness attitude will mature, my patience will increase, and peace will rule my heart. Maybe not every second of every day, but for most of the time I’ll see the fruits of being joyful in the bent days of my life…..the hard times…..the days that seem unending. On Christ the solid rock I stand. All other ground is sinking sand. All other ground is sinking sand. So when we are tossed around by all that we meet in this life…..when we see for real that the ground around us is just sinking sand and that nothing in life is constant…..when the winds of deep trials come our way…..let’s consider it joy. Let’s lean into Jesus even as we lean down with the weight of our circumstances. And just like my bent pepper plant, we can still see that we are alive in Christ and that He has not left us alone. He is still using us and still producing His fruit in our lives……..fruit which will benefit others, and give us joy and maturity. It’s so good to know that God is in control. He both sends the wind that sometimes bends me down, and the strength to be joyful as I stay rooted in Him. May all of us grow fruit for Him and for others to see as we live in the struggles and storms of life. 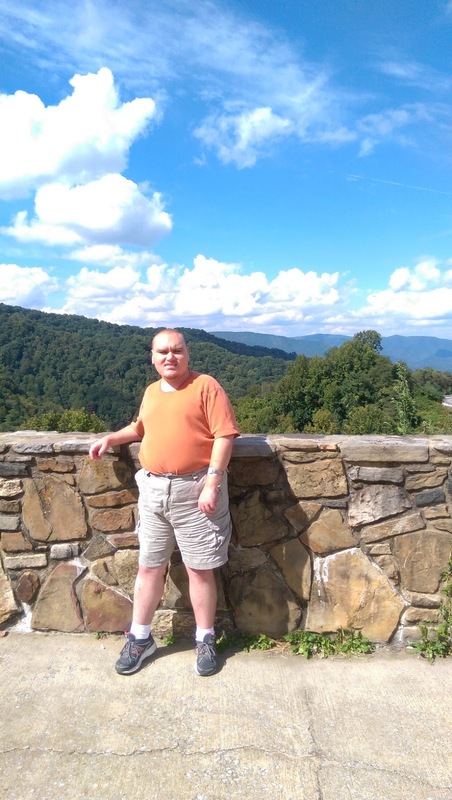 Author hesaidwhatksPosted on September 6, 2015 February 28, 2016 Categories Adult Autism, Asperger's Syndrome, Family, Friendship, http://schemas.google.com/blogger/2008/kind#post, Love, Special Needs AdultsLeave a comment on Tired of Love? This past Saturday was a big day for Aaron. That’s the day that we had his room painted. 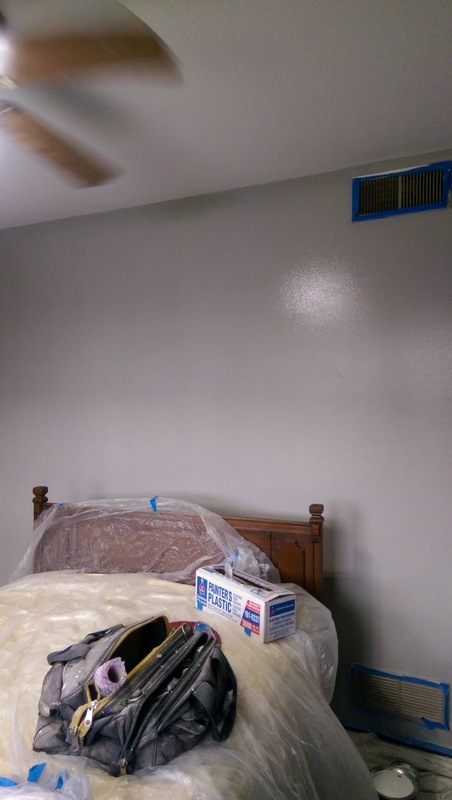 The popcorn ceiling was removed and then the ceiling was painted; his walls were repaired and painted; and then the hall bathroom was painted as well. “Us kid’s bathroom,” as Aaron calls it. It’s fun to have a room painted, especially when you’re not doing it yourself. We hired our neighbor’s friend, Rudy, to do the job for us. 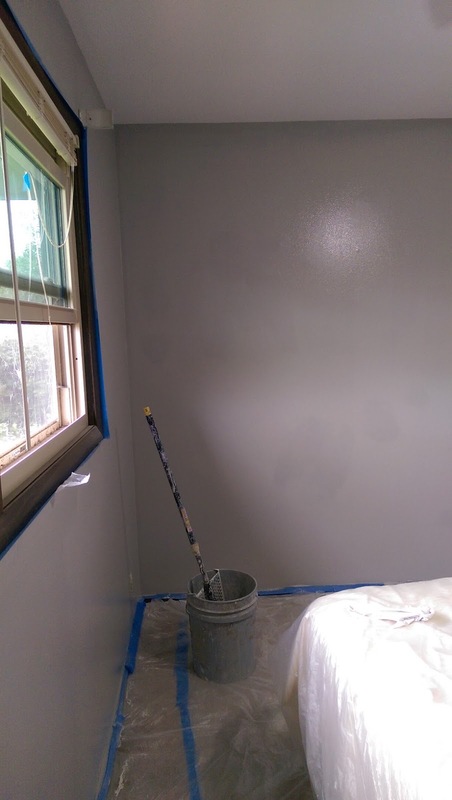 But for Aaron, it’s not fun to have a room painted…..especially when the room is his room. He doesn’t care who is doing it. He just doesn’t like all the ways that it affects him. Of course, we know this about Aaron. That’s why we started preparing him for this big event a week before the job was to be started. As we were eating on that Sunday, we told him with excitement that his room would be painted that following weekend. We exhibited the same enthusiasm as we told him that we would need to move all of his furniture, except for his bed, out of his room before the painter came on Saturday. Aaron tilted his head as he often does and was silent as he thought about what we had just told him. He was staring out ahead, but we knew that in his head things were happening. You could almost hear the wheels turning as Gary and I waited with apprehension for his reaction. Finally he spoke. “Are you moving my book shelf with all my DVDs on it?” he asked. We told him that we were going to move it. We assured him that we could move the book case without removing his DVDs……DVDs that are in a particular order and should not be disturbed by us mere mortal parents who have no idea of the importance of that order. On the next day, Monday, during supper again, Aaron asked about having his room painted. “You’re not messing up my DVDs, are you?” he once again asked. And we once again assured him that we would not mess them up. “Well, can I play my computer? Will it be messed up?” he anxiously asked us. So we assured him that his computer would not be messed up and that he would be able to play it again. “After the room is painted, can I hang my calendar?” he wanted to know. We told him that he could hang his calendar after we decided where all his new wall art was going to be hung…..but yes, he would definitely have his calendar. The smallest things are huge to him. 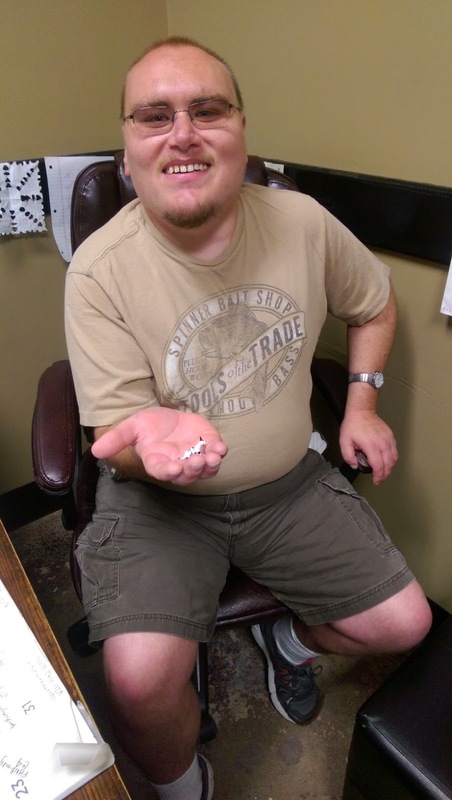 There is no such thing as a small change in Aaron’s life. And later that night, we heard the question again. “So you’re moving my book shelf and DVDs? You won’t mess them up, will you?” This is when I began praying that we wouldn’t tip the book case over and spill the DVDs. I couldn’t even imagine that scene. On Tuesday, Aaron looked at us with worry as we told him that we would move his things out of his room on Friday night. “Can I play my computer just one last time before we paint my room?” he questioned. He sounded like he was making his dying wish, for heaven’s sake! This was just Tuesday, but he was wanting to be sure that on Friday night he could play it just before we moved it. Over the next several days, he continued to ask questions and to try to adjust to this huge coming disruption. The big move on Friday evening went smoothly. Gary even hooked Aaron’s computer up in Andrew’s room, still on Aaron’s own desk, and he was one happy camper…..despite the change. We then broke the news to him that he would be sleeping in Andrea’s bed on that night. He was very skeptical about this prospect. 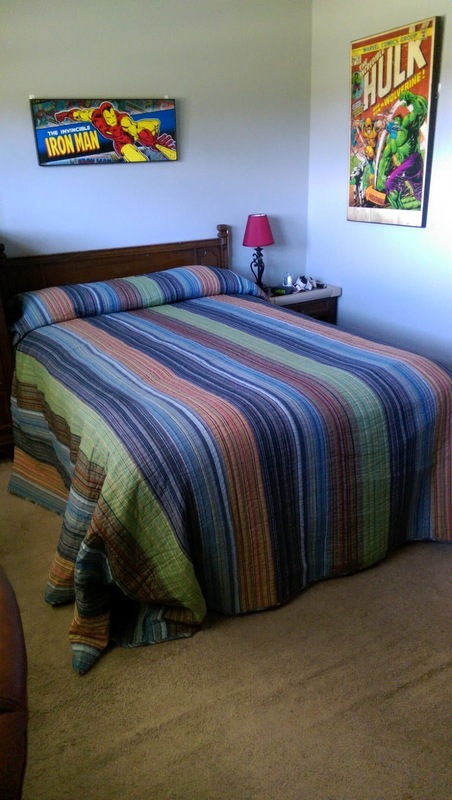 I praised her bed and extolled all of its comfort and convenience, but he wasn’t convinced. He said it wasn’t the same size as his, and I told him it was. He said his sheets didn’t fit on it as well as I took her sheets off and put his on, but I told him they did. I shot down all of his arguments as we placed his covers on the bed in their particular order that he likes and as we placed his snake, skunk, and frog in their certain places. I got him tucked in, turned the light off, and said one last good-night as I closed the door. I went to my room, but it wasn’t long at all before I heard that he was out of bed. I opened his door and found him sitting on the bed, signing his bedtime log. Of course. It’s important for him to record the time he goes to bed and the time he gets up. Once that was done, I tucked him in again and turned off the light. He was in bed once again. Yes, Aaron, we’ll watch Wheel of Fortune tomorrow. Now go to bed. So he went to bed, where I tucked him in once again. It didn’t take long until there was another knock on our door. “Is it going to rain?” he wanted to know. I told him I didn’t think so. “I mean, like a storm?” he asked. No, Aaron, it’s not going to storm. Go to bed. He went to bed again. Soon I heard it. Thump, thump, thump. Aaron was going down the stairs. He was back upstairs before long, where he told me that he went downstairs to say something to Gary…..anything to keep from getting in bed. Aaron…..Go. To. Bed. He did. And he stayed, thankfully. His report the next morning: “I didn’t sleep well. It’s not like my bed where the covers don’t move a lot.” I didn’t have the energy at that point to ask him to explain that one. Aaron handled the actual paint day very well. He stayed busy on the computer, talking to us, going outside to sit by the garden and relax in the leaves and sticks, and generally ignoring what was happening in his room. He showed no excitement or interest at all. His biggest concern was his shower that night. He couldn’t use “us kid’s bathroom” since it was still wet. “It’s 8:00,” he said. “I need to shower.” His shower is at 8:00 every night, or shortly thereafter. NEVER before 8:00. Just so you know. We do. Well, the next night he WAS back in his room. I was worried because Gary wanted to move Aaron’s furniture around. I just knew that this would tip the boat, and be too much change for Aaron. We used our excited voices when we showed it to him. All he cared about was: were his DVDs messed up; was his computer going to work there: and when could he hang his calendar. He was pretty unimpressed with everything else, and pretty irritated as we showed him some new things about his room. “You guys think I don’t know anything about my room!” he impatiently told us. So we kept quiet as he went on playing his computer game. The amazing thing was that he handled the new room with ease. That was a surprise for me! He even slept in his bed that night, happily, despite the fact that his nightstand holding his lamp and his clock were on the opposite side from where they usually are. 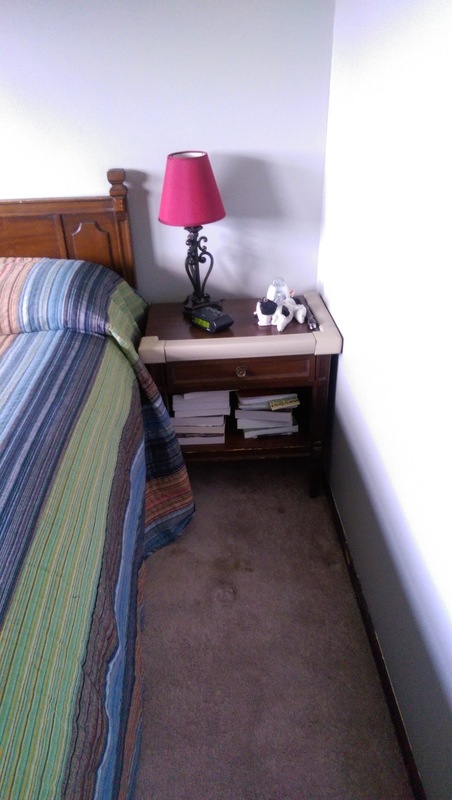 He’s also putting his Handy Answer book on his night stand shelf instead of on the floor like he prefers, and tried to do the first day. Progress!! He followed me as I carried his coffee upstairs to his room on Monday morning. “Can we put the coffee on the shelf like we used to before that man came over?” he asked. He refers to the painter, Rudy, as “that man.” And he says it with an element of disgust, so it shows me that he really is somewhat frustrated by all of this change. 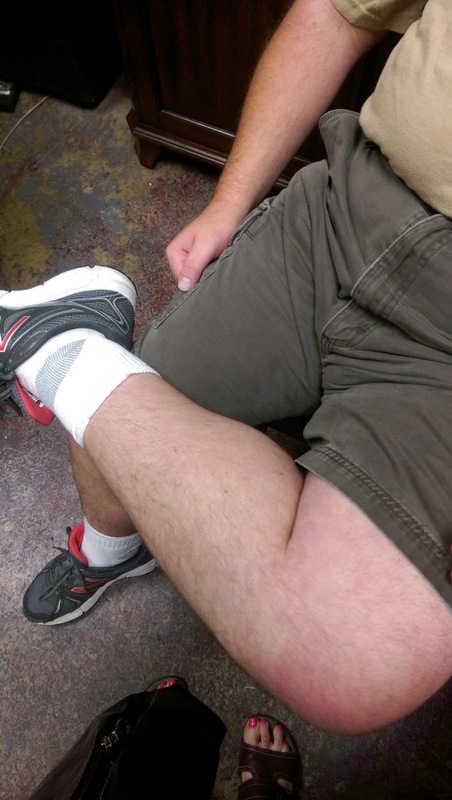 And he blames it on our painter, because Aaron has to blame someone for his discomfort. Aaron’s room being painted is a huge improvement, though he doesn’t seem to care one bit about it. But just as huge is how well he did with this interruption to his routine, and how easily he has adjusted to his new room. Also huge: his DVDs didn’t get one bit messed up. Thank you, Lord!! !